View of “Pulling at Threads,” 2018. Framed as a meditation on craft in contemporary artistic practice, this exhibition marshals works by eight artists—including Nick Cave, Abdoulaye Konaté, and William Kentridge—to stage an argument about the postdigital “return to the haptic.” Beading, collage, sewing, and weaving feature prominently. Many of the selected works invite what film theorist Laura U. 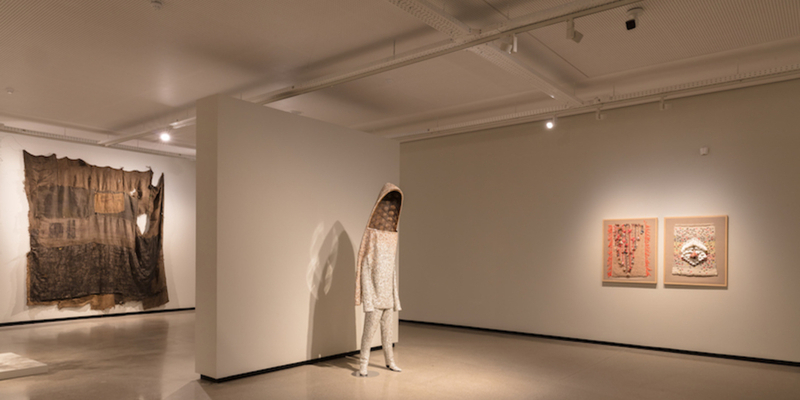 Marks, in her 2002 book Touch: Sensuous Theory and Multisensory Media, described as “a small, caressing gaze.” They include Igshaan Adams’s Oorskot, 2016, a fragile columnar form made from beads, fabric, rope, and wire; and Nick Cave’s Soundsuit, 2012, a wearable costume featuring an elongated dome made from a pleated-wood basket—the suit is decorated with bugle beads and buttons. An accompanying video, Gestalt, 2014, presents a selection of Cave’s outfits being worn during a performance. Their quivering and jingling sound engulfs the exhibition. The selection is evenly split between abstract and figurative works, although Maria Nepomuceno’s three untitled sculptures (all 2016) made from beads, ceramic, rope, and resin hover between—they vaguely suggest human and plant reproductive organs. At least half of the works on view are the product of collaboration. For instance, Marguerite Stephens and a team of Johannesburg weavers helped produce Kentridge’s City of Moscow, 2009, a mohair tapestry featuring a large cartoon of a rearing stallion overlaid onto a collaged map of the Russian capital. Both Konaté’s Composition Bleue avec Orange et Jaune, 2016, an ombré drapery with symmetrical rows of predominantly indigo fringes, and Liza Lou’s Axis Defeat, 2007–08, an engrossing depiction of a dissolving Persian rug made from tubular glass beads, were produced with the aid of assistants in their large studios. Even the used jute sacks orchestrated by Ibrahim Mahama into the square drapery TECHIMAN AFRAM, 2017, bear vestigial traces of their past owners.